You roll a 6 sided die. How likely is it that the die will land on 3? 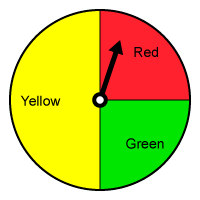 How likely is it that the spinner will land on a yellow or green space? 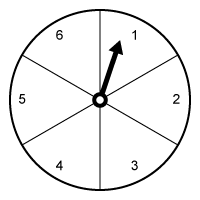 How likely is it that the spinner will land on the number 8? You roll a die. How likely is it that it will land on a number less than 6? You spin the spinner 3 times. 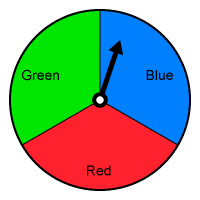 How likely is it that it lands on blue all 3 times? 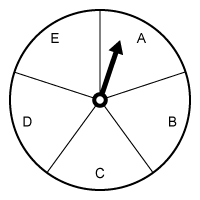 How likely is it that the spinner will land on a letter of the alphabet? You roll 2 dice. How likely is it that you roll a 2 and a 5? You roll 2 dice. How likely is it that the 2 numbers will add to 12 or less? How likely is it that the spinner lands on the color purple? How likely is it that the spinner will land on a number greater than 2?